In this article, we are going to learn how to create components, display a component using router outlet, show a menu list on mouse over, & load component on button click event. In this second part of my Angular 6 article series, we are going to learn how to create components, display a component using router outlet, show a menu list on mouseover, and load a component on a button click event. PART 1 - How to create components and display a component using router outlet. Now, right-click on the components folder, click on "Open in terminal". Now, your terminal opens in Visual Studio Code. 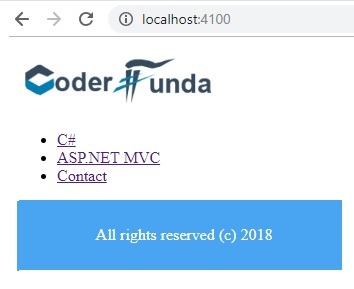 I am going to create three different components for three different menus, i.e., C#, ASP.NET MVC, Contact Us like csharp, mvc, contactus. To create a component, use the below syntax. From the above syntax, I am creating components. After successful creation, each entry gets added into an app.module.ts file. For more information, see the below file. Now, add the below line in app.module.ts. The Angular Router is an optional service that presents a particular component view for a given URL. It is not part of the Angular Core. It is in its own library package, @angular/router. Import what you need from it as you would from any other Angular package. Also, import the path and component names as below. Now, to redirect the appropriate component, use the below syntax and add this to the app.component.html page. The RouterOutlet is a directive from the router library that is used as a component. It acts as a placeholder that marks the spot in the template where the router should display the components for that outlet. For a better look & feel, I am going to add some CSS in each component for the paragraph tag. To see the folder structure of our project, refer to the below image. Your output will look like this. 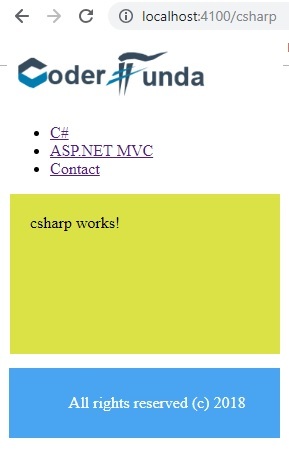 Now, click on the C# menu and you will get the output as below. 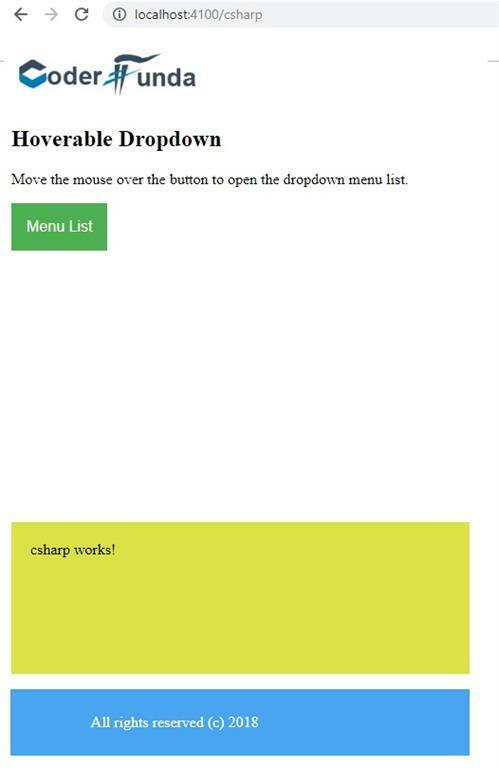 As we have header.component.html, I am going to create a dropdown list which contains menus. 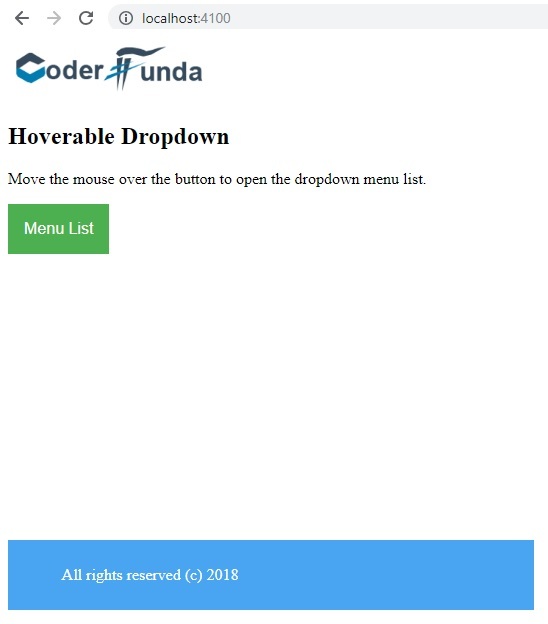 The user would like to open the drop-down menu list on mouseover of the button. Below is the code to create a drop-down list in the header.component.html file. 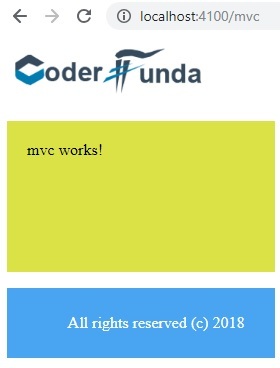 I have commented the old code for the time being. In header.component.css, by using a class, we are applying CSS and the mouseover effect. PART 3 - Load specific component on button click event. Now, I am creating one component, i.e., Home. Use the following syntax. In home.component.html, create one input button with an onclick event as below. After that, create an object of the router into a constructor. Here is the complete code for the home.component.ts file. Now, run the application and call the home component. 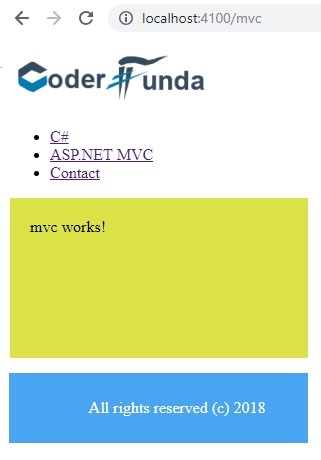 Click on "Go To MVC" button and it will redirect you to the MVC component. 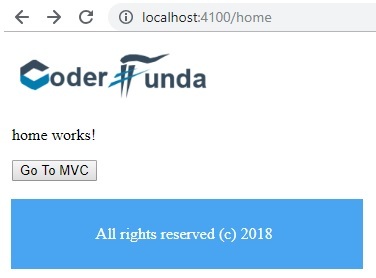 In this article, you learned how to create components, display a component using router outlet, show a menu list on mouseover, and load component on button click event.